When fresh fruit is in season, home made yogurt is my breakfast of choice. Instead of buying the large and expensive containers of good yogurt at the store, I find it’s economical to make my own. I’m a fan of the plain kind; it becomes a blank slate for me to add jam, fruit, granola, or anything else I’m hungry for at the moment. The instructions below will depend on the size of your yogurt maker. I have one that makes seven cups worth of yogurt, so that’s the amount of milk I use. You can make yogurt without a yogurt maker, but it’s a little more tedious. I find that I use my maker enough to make the initial cost worth it in the end. Heat the milk on the stove to 180 degrees. Cool the milk down to 112-108. (I put the pot in an ice bath to speed up the process.) After the milk is down to 112 degrees, add a cup or container of your favorite yogurt. I like the local stuff I buy at the farmer’s market; the one cup cultures and flavors the entire batch. From there, pour the liquid into the yogurt maker’s jars. Put the jars in the incubator without the lids. Leave in the incubator for 6-8 hours, or until you reach your desired firmness. The longer you leave it, the more sour the yogurt will be. Once finished, put the lids on the jars, and put them in the refrigerator. Right now, the yogurt is so good paired with peaches and granola. (My favorite granola recipe is Smitten Kitchen’s.) In the winter, this yogurt is great with a spoonful of jam. Breakfast, lunch, or afternoon snack, homemade yogurt suffices for all. When the figs are ripe, they must be eaten. Another no-fuss recipe is just to throw cut fresh figs on a bed of greens. I candied the pecans for a slightly sweeter addition, but this step of course could be omitted, and regular pecans could be used. This recipe would feed four as a side dish complimenting just about anything grilled. To make the candied pecans, heat the cut nuts in a skillet on medium heat. Dump in the sugar and stir constantly. After about 7 minutes, the sugar will start to melt, and will coat the nuts. As soon as this happens, move the sugar coated nuts into a separate bowl. Do not put the nuts onto the salad until they are cool; they’ll wilt your lettuce if you rush this step. Mix well and drizzle over salad. My lemongrass is going gangbusters in our yard now, so I decided to use it in this Thai dish as both an ingredient and as skewers. Lemongrass grows extremely well in temperate Florida; our patch that started out as a few small stalks is now two feet wide and over six feet tall. The aromatic herb has more uses than just flavor; Mexican folk claim its medicinal qualities include aiding digestion and calming nervous disorders. For this dish, I used lemongrass and ginger from my yard, and local Gulf shrimp. Peel the shrimp, and place in a food processor with the egg whites until mixed. Add the rest of the ingredients. For the lemongrass, if you’re using fresh stalks, use only the bottom bulb and remove the tough outer leaves. Lemongrass is really fibery, so if you don’t chop it small enough, the stringy threads can be a nuisance when eating. Mix all ingredients, and shape into oblong meatballs on the lemongrass skewers. (It doesn’t matter which part of the stalk you use here, since the skewer is only for flavor; it is not to be eaten.) Place meatballs on the grill at medium-high heat for 5 minutes on each side. I served this dish with grilled vegetables and polenta. This meal makes enough for 6-8 people, if you want it as a main dish, or you could make the meatballs smaller and serve them as appetizers. I have a salty tooth, not a sweet one, so when I crave something, I reach for something crunchy with salt. These kale chips are a healthy way to satiate my afternoon craving. Using the kale from my garden, this recipe takes hardly any time at all to whip up. I like to add dried jalapeño flakes that I made from an overabundance of the peppers last year, but if you’re not a spice fan, you can leave it out. Preheat oven to 350 degrees. Wash kale. Make sure that the leaves are very dry before you add the oil. I use a salad spinner to get off the excess water, and then blot dry with paper towels. If the leaves aren’t dry enough, you won’t be able to get your “chips” crispy. Washing can also be done in advance so you can be sure of the dryness of the leaves. Chop the kale, and place in a bowl. Mix in the olive oil. Massage the leaves with your fingers to make sure everything is coated properly. If you need more oil, add it. Sprinkle on some salt and pepper flakes if you’d like. Bake for 10-15 minutes, or until the leaves begin to brown. Last month when I was in France, my French sister-in-law’s friend made the most delicious tomato tart for dinner one evening. It was the perfect appetizer, paired with their own winery’s Rosé, eaten outside among the Oleanders and stone houses. No, Florida is nothing like France. But I did have tomatoes and green onions in my garden that I thought might make a comparable tart that might vicariously take me back to the Old World. It’s not exactly the same, but it’s as close as I could come. To make the tart, spread out the puff pastry on an insulated pan. (I tried using phyllo dough the first time. This does not work. Do not try it.) Next, spread the mustard across the entire pastry like you would a pizza (keeping the edges clean). The mustard is KEY to making this dish. I like the Musette mustard that I can get at my local grocery store for about $4. It’s creamy, slightly sweet, and does not have the seeds or the vibrant yellow color of other mustards. Spread this liberally on the pastry dough. Next, put the tomatoes, onions, and cheese on the dough. Cook for 20 minutes at 400 degrees. If you’re really trying to channel the French, serve it with some Rosé and good cheese. Bon appétit! What to do with all your garden’s zucchini always seems to be the summer’s quandary. I do not have the fortune of having zucchini in my garden; my husband will not let me “waste space” on zucchini, much to my dismay. But I can get little ones still from the Farmer’s Market, which is where I got these. In my opinion, this recipe will make even zucchini skeptics love the green vegetable. Cut zucchini into thin slices. Heat a skillet and olive oil over medium heat. Once hot, add the garlic. Throw in the zucchini and sauté until they start to lightly brown (about 5-7 minutes). Once cooked, throw in the tomato sauce. Simmer until tomato sauce is warm. Add shredded mozzarella and serve. The dish goes great as a side with sausage links and polenta, or as a main dish for lunch, as I did here, served with a crusty baguette. Our limequats are ripe, and thus cocktail time it is. The limequat is a cross between a Key Lime and a kumquat; limes are tropical fruits and because of our subtropical latitude here in North Florida, we still can get some freezing temps in the winter that limes just don’t like. This hybrid tree, however, can withstand the cold. The tiny limes are perfect for happy hour drinks. Pimm’s Cups are a favorite of the British. The liquor, Pimm’s No. 1, is flavored with fruit and spice, and is really refreshing when used in this cocktail. Garnish with peaches or limes as I did, or the traditional cucumber and orange slice. Cheers! Fresh tomato sauce is one of those things that once you taste it, you’ll never go back to the canned stuff. Moreover, it’s so easy! And it provides something to do with the abundance of tomatoes in your garden! Win win win situation. Just about any fresh tomatoes I’ve found will do. When I lived in the Midwest, I could grow beautiful Romas that made great sauce since they’re more meaty than watery. Down here in Florida, the humidity hinders large tomato growing (I’m still in denial about this, and plant Romas and Beefsteaks every year only to have them wither and die). However, cherry tomatoes and yellow pears like these grow in abundance. When I pick more than we’ll be able to eat in a couple of days, I wash the extras, cut them in half, and throw them in a quart ziplock bag I keep in the freezer. When I fill that one up, I start another. Frozen tomatoes loose their nice consistency, but they keep their flavor, which makes this recipe great for being able to have a taste of summer anytime of the year. Heat olive oil in a big stockpot. Once hot, add the onions and garlic. Sautee until the onion is clear. Add the rest of the ingredients. If you’re adding frozen tomatoes, there is no need to thaw them; just throw them into the pot. Bring to a simmer, and then turn heat to low. Cook on low for four hours while covered. Stir occasionally. After the sauce cools, puree the mixture in a blender. As shown here, I fill numerous pint-sized containers and stick them in the freezer. When I want to use it as marinara for bread dipping, pasta sauce, or with lasagna, I just thaw it and add it to our meal. All the work has been done ahead of time, so it’s a quick weekday fix. It also makes a wonderful pizza sauce, although I like to boil the pint amount in a sauce pan to get out some of the water before putting it on the pizza. I recently read Michael Pollan’s newest book, Cooked: A History of Food Transformation, which sparked my curiosity about how to cultivate wild yeast. According to him, the flavor of bread depends mostly on the yeast (think sourdough from San Francisco). The fast-acting yeast available at supermarkets work great–they can rise dough in a matter of minutes–but the flavor of local funkiness is often lost. Pollan claimed that cultivating one’s own yeast is easy, so I thought I’d try it. All you need is fresh fruit, preferably from your back yard. I used a handful of figs from my yard. Grapes, cherries, and just about any other fruit that is easy to submerge could be used. 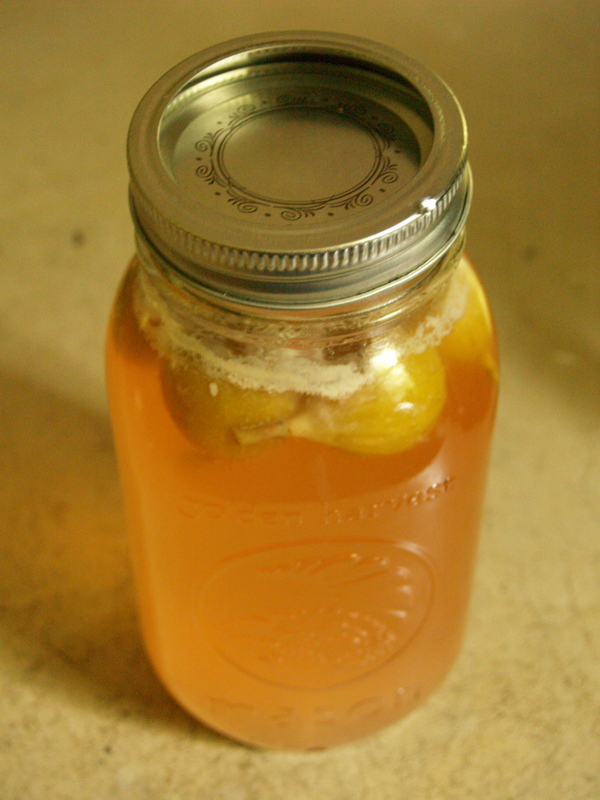 In order to cultivate the yeast, put the fruit in water without washing it. Leave it on the counter covered with cheesecloth or a loose lid for three days. You’ll see the water begin to froth, and it will smell somewhat like wine. Combine all the dry ingredients in a bowl. Place in a mound on a clean flat work surface and make a well in the middle. Add the dry yeast to the yeast water and stir. Pour the mixture in small amounts in the flour well. Because the flour is so fine, it’s difficult to stir them together. Be slow and diligent. Once you have a ball, kneed it for 5-7 minutes. 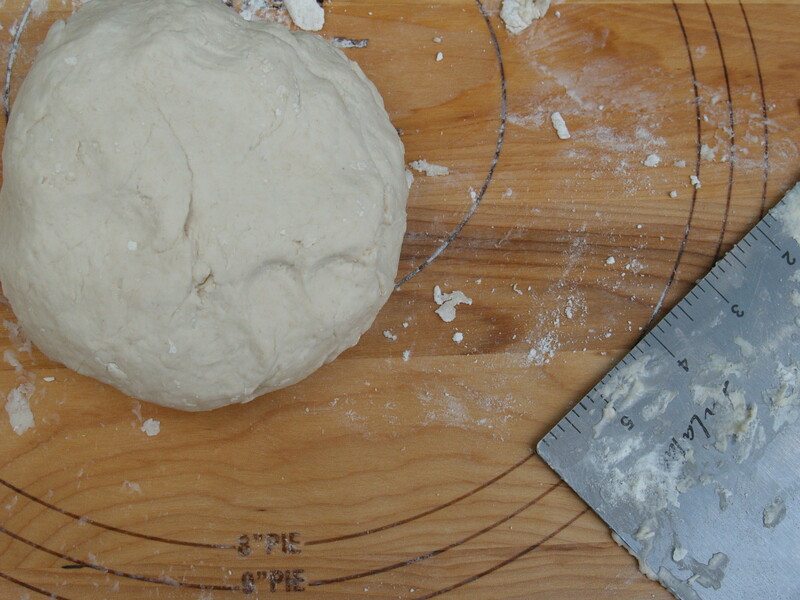 Once the dough has risen, cut into four pieces for personal sized pizzas. This recipe will make four. Use your favorite toppings. I used my home-made tomato sauce, and green onions and tomatoes from our garden, and wild boar sausage. I added fresh mozzarella as well. I put cornmeal on a wooden peal (it acts like ball bearings) which allowed it to slide onto my preheated pizza stone. Cook in the oven for 500 degrees, or on a pizza stone on the grill for 10-12 minutes. This meal is a great way to use up those vegetables from your summer garden!